As co-lead counsel, we secured $671 million in total settlements, including one of the largest settlements with an auditor in securities class action history. Labaton Sucharow served as co-lead counsel in In re HealthSouth Corporation Securities Litigation, a case stemming from the largest fraud ever perpetrated in the healthcare industry. On behalf of the New Mexico State Investment Council and the Educational Retirement Board of New Mexico, the Firm, along with co-counsel, filed a class action suit under federal securities laws alleging that HealthSouth falsified its revenues and funded a series of massive corporate acquisitions for the purpose of perpetrating a systematic Medicare and accounting fraud. The complaint asserts that while company executives misled investors into buying the company's stock, they sold vast amounts of their own personal shares of HealthSouth stock for huge profits. The plaintiffs also allege that HealthSouth was able to keep its fraudulent practices hidden from the public through the assistance of its auditors, Ernst & Young, and its principal banker, UBS, among others. The lead plaintiffs alleged that Ernst & Young accepted millions of dollars in purported auditing and consulting fees in exchange for turning a blind eye to the Company's accounting fraud. Similarly, the plaintiffs alleged that UBS profited from its role in concealing HealthSouth's fraud through orchestrating deceptive financial transactions, withholding information about the true financial condition of the company, and making false statements about HealthSouth's financial condition, including the publication of false analyst reports aimed at deceiving investors into believing that HealthSouth was a healthy and legitimate company. All the while, the lead plaintiffs alleged, Ernst & Young and UBS were fully aware, and indeed an integral part, of the historic fraud perpetrated on HealthSouth's stock holders. Evidence presented in connection with the guilty pleas and criminal convictions of 15 former company employees has buttressed the lead plaintiffs' prosecution of this case. In early 2006, the lead plaintiffs negotiated a settlement valued at $445 million with HealthSouth Corporation and several of the company's former officers and directors, which was approved by the Court on January 11, 2007. The HealthSouth partial settlement, comprised of cash and HealthSouth securities, is one of the largest in history. On June 12, 2009, the court also granted final approval to a $109 million settlement with defendant Ernst & Young LLP, which at the time was believed to be the eighth largest securities fraud class action settlement with an auditor. On July 26, 2010, the court approved a $117 million settlement with the remaining principal defendants in the case, UBS AG, UBS Warburg LLC, Howard Capek, Benjamin Lorello and William McGahan (the UBS defendants). The settlements are being distributed to Authorized Claimants. 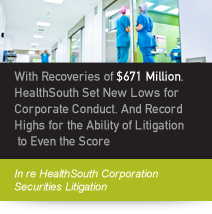 The total value of the settlements for Healthsouth stockholders and Healthsouth bondholders, who were represented by separate counsel, is $804.5 million, which is the eleventh largest settlement filed after the passage of the PSLRA based on the SCAS 100 for the first quarter of 2010.